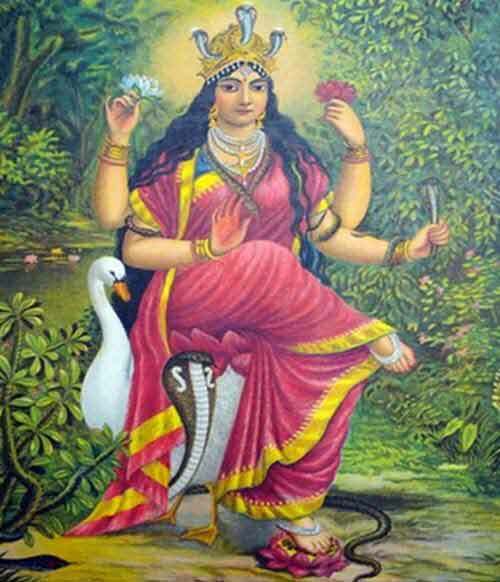 Manasa Devi Puja, dedicated to Snake Goddess, also known as Nag Panchami, is observed mainly in Bengal, Jharkhand, Assam and parts of Orissa on various days in the Bengali months of Ashar, Shraban and Bhadrapad (June - September). Manasa Devi Puja 2019 dates are July 22 and August 5. Mansa Devi is the serpent goddess and is believed to be the daughter of Lord Shiva. The rituals are also known as Manasa Devi Ashtang Puja. The rituals associated with the pujas are held on the fifth day or Panchami day of all fortnights in the month of Ashara and Shraban. In some regions the pujas and rituals continue for a month and numerous rituals are performed during the period to appease Manasa Devi. There are numerous rituals associated with Manasa Devi. From simple prayers to rituals which many might consider as grotesque. Manasa is the goddess of snakes and fertility. She fulfills the wishes and protects one against snakebite. Associated with the earth and higher knowledge, she is worshiped mostly in eastern India. She is also propitiated by those not having children for an early child birth. Special murtis of Manasa Devi are prepared during the period and worshipped. Goddess Manasa was the daughter of sage Kasyapa and Kadru, the sister of the serpent-king Sesha. She is said to have the power as well to cure infectious diseases and shower one with wealth and prosperity. She is ritually worshiped with sacrifices offered to her during rainy season, since snakes are most active in this season. She is sometimes said to be a pre-Aryan goddess. It is popularly believed by tribals and numerous other Hindu communities that they can remain healthy and prevent themselves from being bitten by snakes by paying obeisance to Mansa Devi. Legend has it that Manasa requested, Lord Shiva, to include her in the pantheon, so that she is worshiped by humans. Shiva responded that if Chand, a businessman, of Anga kingdom agrees to worship her, then her wish would be fulfilled. Chand had no respect for Mansa Devi and he suffered immensely. He went bankrupt and all his sons were bitten by snakes and killed. The youngest son is killed on the wedding night by a snake bite. The young widow accompanies her husband to heaven and here she finds out the reason for all the misfortune that had befallen on the family. She returns and convinces her father-in-law to worship Mansa Devi. The businessman was able to regain is previous glory after worshipping the Snake Goddess and it is believed that the worship of Mansa Devi started from the day. How is Manasa Devi Puja Observed? In some regions, people pierce their body to appease Manasa Devi. Display of poisonous snakes is another major event during the period. The goddess is also appeased by those people who do not have children. During the period special idols of Goddess Manasa Devi are prepared and worshipped. Another major highlight is the use of live snakes in plays (theater or drama) depicting the story of Manasa Devi.